The very ancient civilization of Sumner existed in the area now recognized as the battle-scarred region of Southern Iraq. Before it was demolished by U.S. bombs a great deal of important archaeological work was done to reveal what we presently know about the Sumerians who existed there an estimated 5,000 years ago. It is known that the Sumerians may have been among the first civilizations to develop agriculture, trade with other tribes, created weaving, leather work, metalwork, masonry and pottery. Then around 2,500 BC they created writing. They didn’t have pen and paper, or even parchment and quills in that time. Instead they scribbled images that signified words on clay tablets that were collected in what can only be described as an early attempt at libraries. It is said that tens of thousands of clay tablets have been dug from the ruins of the ancient cities of Sumeria in a region eventually known as Mesopotamia. Much of the information inscribed on those tablets involved daily records of trade agreements and reports of routine activities. But some of the tablets recorded important stuff, like the history of the tribe, including a fascinating piece of clay that contains what is known as The King’s List. That document, which is today contained in the Ashmolean Museum at Oxford, England, strangely suggests that the people who drafted it had access to historical knowledge that went beyond stories passed down from fathers to sons. It implies that earlier books existed, and earlier forms of writing were used perhaps thousands of years before Sumeria came into existence. The list names the early kings of Sumner plus all of the neighboring dynasties, the length of time they reigned and the locations of their rule. The people at that time believed kingship was handed down by the gods. The list implies that the kings were, themselves gods who lived and ruled for thousands of years. This suggests a mythologizing of the stories and many historians believe their existence was mere fiction. Yet there is evidence such dynasties existed, and such rulers may also have been in play. While the list is considered an important historical clue as to the chronology of the Third Millennium BC, the data is difficult to read because it obviously overlaps dynasties that were operating in the same time periods. All of this leads us to an understanding of Alulim, the first king on the list, and possibly the first recorded ruler of a community. What we know about Alulim is found on the King’s List and nowhere else, so the data is thin. But assumptions might be made. He was the first king of Sumner according to the antediluvian section of the list. Other Sumerian writings state that Enki, the god of Eridu, brought civilization to Sumner. Eridu is believed to have been the oldest known city in the world. Its ruins are an archaeological site in southern Mesopotamia. Two contemporary scholars offer some thoughts about Alulim. 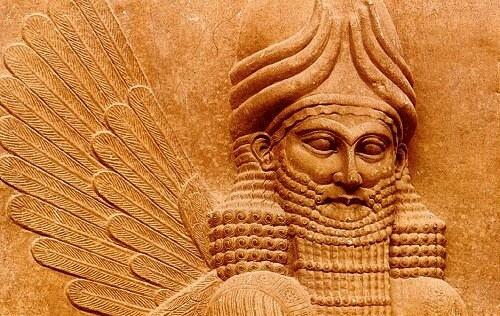 University of Michigan archaeologist William H. Shea has suggested that the name Alulim was derived from Adapa, said to be the son of the Sumerian god Enki who brought the arts of civilization to the region. He concludes that the name may also be the origin of the name Adam in the Book of Genesis. The late William Wolfgang Hallo, who taught Assyrian and Babylonian literature at Yale University, drew a link between Alulim and the myth of Apkallu, a demigod said to have been created by Enki to establish culture and bring civilization to mankind. Apkallu was described as one of several fish-like men who served as advisers to the earliest kings of Sumner before the flood. Of course there is an ancient myth about a very old civilization of humanoids who were covered in scales. But that is a different story.